The Tuscany Umbria border is not very flat and unless you are a very keen cyclist you may find it too much effort to get around, particularly if you are staying at a holiday villa high up on a hillside! Today we went to try out a new service being offered to visitors to the area, electrically assisted bikes. The new business is based in the centre of Lisciano Niccone at the western end of the valley and is run from the offices of BRS Baffi Residential Services, you should be able to spot it, there is a yellow spray painted bike mounted on the wall outside. 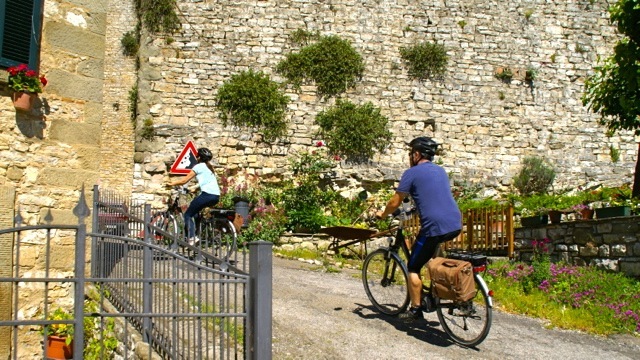 We were amazed at how easy the bikes made riding up steep hills, as part of our test route we climbed up to the ruined castle of Pierle and cycled around the adjacent hamlet. as well as conventional gears there are several levels of electric assistance and the bikes actually respond to the amount of effort you are putting in, adding extra power as you push harder. 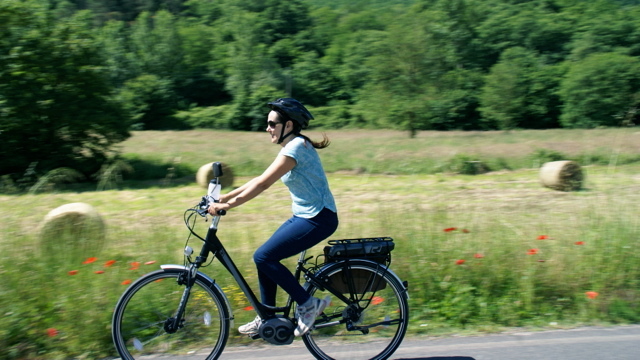 With conservative use the battery will last for around 80km (50 miles) and the business owners, Tim Hudson and Louise Anderton have compiled routes with “e-bike friendly” restaurants, that is, you can recharge the battery while you enjoy lunch. We are very excited about the opportunity these bikes will offer our visitors. On a bike you can see the area in a completely different way, and the electrical assistance means that you can cover huge distances without becoming worn out. 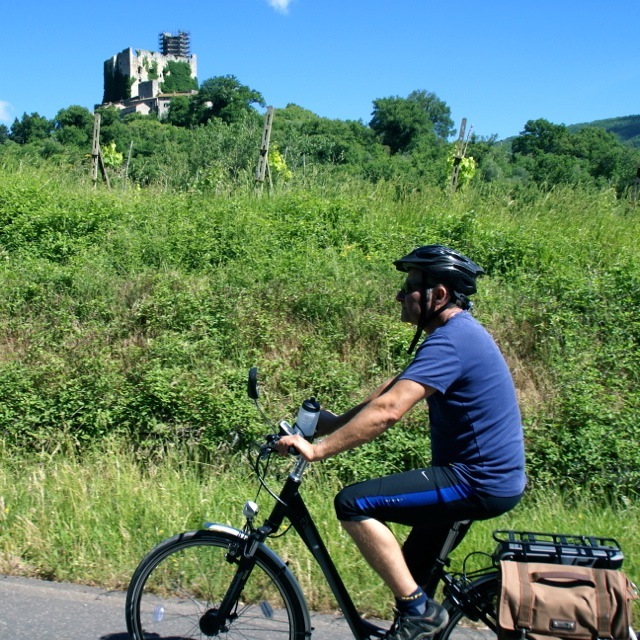 Suddenly, a gentle tour of local hill towns becomes possible by bike or perhaps a route taking in a few wineries. If you are staying at one of our properties and are interested in renting these bikes, please let us know, we will be happy to arrange it for you.